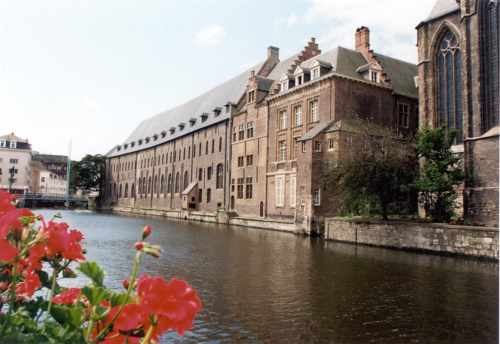 'Het Pand' is an old Dominican monastery located in the heart of the city on the banks of the river Leie, near the medieval port with the guildhalls as its remnants. We have added a small map on our site with directions. You can find it here. The history of the building dates back to 1201. Besides the chapel of St. Michael was then in Onderbergen a hospital under the name "Utenhove Hospital", named after its founder, canon of Utenhove. Already in 1228 the hospital was too small and moved it to the (Old) Bijloke. The vacant building was given to the Dominicans. These early monastic community was founded in 1216 by St. Dominic and settled in Ghent at the request of Ferrand of Portugal and Johanna of Constantinople, Count and Countess of Flanders. Dominic's followers built their monasteries mainly in cities and were themselves actively engaged in and preach repentance. (As they took their name from preachers). The released Utenhove Hospital became the core of the new monastery domini kane. Around 1240 the monks began to build a church on the south side of the complex (which is currently the nineteenth century row of houses on the street is Jacobins). This huge construction was 52 meters long, 22.5 meters wide and had no pillars to support the vault. Of all places in the church the pulpit one could see and hear the preacher. Between these two buildings was the Lys, entirely in stone, a new wing built (the current Wing Lys). For the covered cloister and the magnificent stone tracery windows was called upon sponsorship of Margaret of York, Duchess of Burgundy. In the wall of the building you see is the location of the memorial stone to remember this fact. The stone is gone, but we know from scriptures that the duchess, the construction of the "librairie" or monastery library, which is over an extended part of the cloister, has funded. 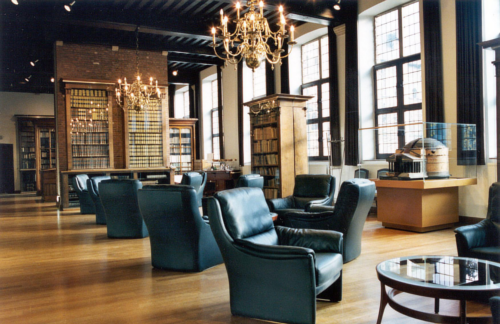 According Derolez Albert, head of manuscripts and rare books section of the Central Library, this is also the only medieval library hall in Belgium whose foundation date is fixed and whose space has come to us virtually intact. "Although the original location of the windows were changed, we can still a good idea of the establishment of the scientific library with its books chained to desks." "The location of the monastery library was fully in line with the traditional medieval rules for library construction: on the first floor, above the monastery, and in windows that receive morning light of." The collection must have been extraordinarily rich, if only the "right of control" that the Dominicans were granted to all books and writings in Ghent saw the light. "From the famous boekenkollektie However, little has been preserved," said Albert Derolez. "The rich collection of books went to the iconoclastic completely lost on August 22, 1566. Not only by the Dominicans exercised Inquisition, but their sermons made them in the 16th century when reformers Especially hated. "At the outbreak of religious turmoil, their monastery and church to be the first victim of pillage and destruction. The chroniclers know in this context to mention that the torn paper and snow down fluttered and so many books in the Lys was thrown to one of the river dry-shod could cross. "But the preachers, were not as quick to deter and pulled back their battered monastery. In 1578 repeated itself almost an identical scenario. Again the preachers were expelled, this time by Calvinists. Until 1584 was a Calvinist college in the building housed the church and was used as a temple. At the residence of the Dominicans in the building ended with the French Revolution. The French troops simply abolished the orders, and again preachers were driven from their monastery. Monastery and church were on the auction block. Through front men managed some old monks are just in their ads to buy a whole. They took up residence again, this time as ordinary citizens, not as a religious community. But the maintenance of this ancient building was now too expensive (the history will repeat itself later). And the former preachers could no longer bear the cost. Moreover, their religious community was dying. In 1822 remained exactly four priests and one brother over. Pope Leo XVII gave permission to sell the buildings and the building got a new owner, a certain PD Velleman, who took the cash register ringing. The refectory was a sales room for furniture, the sacristy and chapter house storage for wine in the courtyard erected sheds, and everywhere, even in the corridors were separating walls cemented to the number of rentable rooms in this huge tenement enlarge. This situation would persist for more than 130 years. The Property gradually showed signs of decay. The then owner decided one of the two churches that severe signs of aging begin to show, abort. St Michael's church survived but the other was under demolition. In 1860, the monument disappeared forever from the Ghent cityscape. On the slums only came to an end after World War II. In 1946 a portion of the property listed. 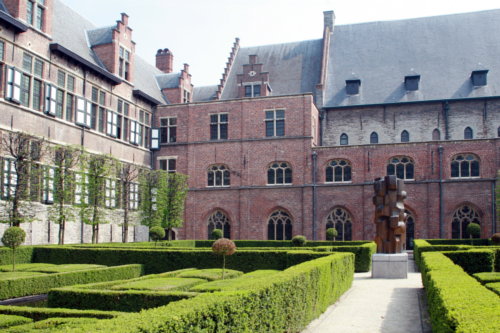 The monastery, with its cheap rooms nevertheless remained a magnet for students, artists, tramps and Ghent. From that time dates the nickname of 'flea palace. In 1953 the owner asked permission to three of the four cloisters to demolish and replace them with modern apartment buildings. His request led to a study of the complex and ... to classify the entire building (October 1956). That did not prevent the property now also been declared uninhabitable, so the owner decided to sell. 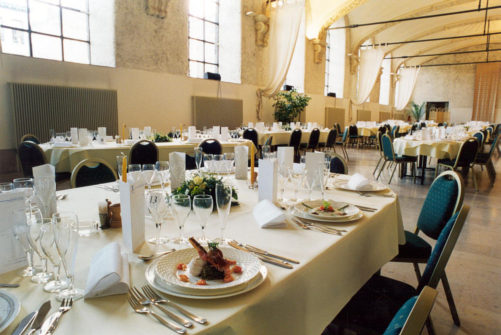 On January 25, 1963 was the heritage of Ghent University for 18 million francs to the new owner. 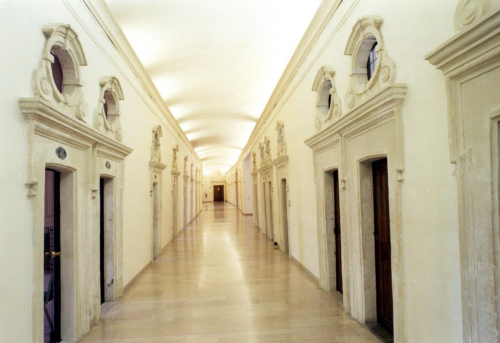 The Director of Buildings was entrusted with the renovation and restoration. The works started in 1971 and completed in the spring of 1991. Article published in the magazine 'Ghent University', October 1986.